This photo is at the end of the Cwm (valley) looking back inland. It’s quite interesting because all of the rock either side here (out of view) is grey liassic limestone that weathers to a light buff colour. But all of the buff coloured cliff face here is post glacial tufa. Tufa is a calcareous deposit. All of the cliff that you can see here is lime that has precipitated from the valley stream since the last ice age – only about 12,000 years ago. So the cliff has slowly built up from the stream. The stream is currently quite small and now comes out of the bridge structure over to the right. Freshwater snails live in the stream and the cliff here is full of snail shells. By taking snail shells from down a vertical line in the cliff then it’s possible to work out the climate/temperature fluctuations over the 12,000 year period as the type of snail varies depending on the temperature. 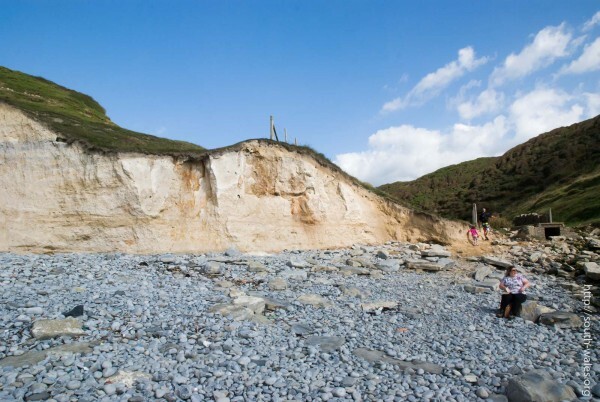 The cliff here is also famous for recently displaying a pair of human leg bones sticking out of the very top of the cliff – it would appear that the top of the cliff was being used for burials and the bones appeared as the cliff retreated. Park at the farm at the top of the valley (£2 per car) and walk down the valley to the beach. It’s less than 2 miles there and back but you have to clamber over 3 stiles and the path is quite uneven in places. So it’s not advised if you’re of limited mobility. Also, check the tides here – http://www.ntslf.org/tides/tidepred?port=Mumbles before you go as the beach itself is inaccessible at high tide. WARNING: If you walk along the beach in either direction then keep an eye on the tide behind you as you can get cut off, and at best you will need to be rescued. At worst you will drown. If you are trapped there is no way out. Seriously, be careful.